Before I get into todays build I want to mention that our guild leader was nice enough to team up with me for a couple hours in 2's and later with another guild member. We ended the evening at 1626! 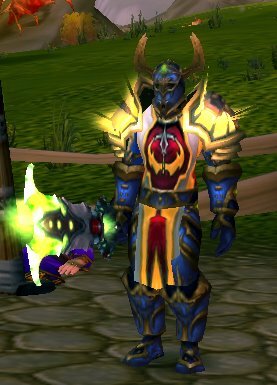 I'm off later today to pick up my Hateful Gladiator gloves, both the Scaled for my Ret and Ornamented for holy. I may be able to pick up a deadly pendant if I can farm enough honor but at just under 48k honor I'll only be able to pick it up for 1 spec at most. What do you guys think, should I pick up the Pendant of Dominance for Holy or Victory for Ret? Heart of the Crusader vs Improved Judgments - You could spec into Improved Judgments for the 2 second reduction, as a Ret it seems almost a given. But playing Holy remember that your partner(s) will be making use of that extra 3% crit chance on the target. As long as you judge often enough to keep it up most of the fight HOC wins out I think. Divine Intellect vs Holy Guidance - You're going to have to go 3/5 in one of these talents. I've seen both variants when looking at top holy pallys. I chose Intellect as it affects your mana pool, crit chance AND Mana per Second. My intellect is currently sitting at 660 so the extra 2 points in Holy Guidance give me an extra 49 spell power (because the intellect would lower to 620 if I lost the 2 points in DI). vs about 40 points of intellect boost from DI.... I don't care to do the math, but the extra Intellect seems like an overall good choice. Here's an Elitist Jerks thread that does some calculations for you. Divine Illumination vs extra Judgments of the Pure - Yep, I skipped out of Divine Illumination for an extra point in JOTP. After about 50 arena matches I found myself hardly ever going out of mana. But if you play 5's or find your matches going long you may want to remove a point in DI for this talent. That's it for now, Monday is the 51/0/20 build.